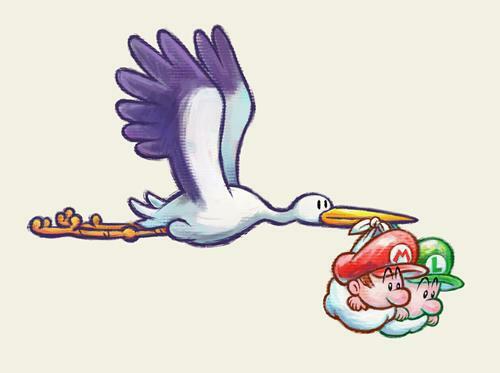 Following on immediately from where the Super Mario World 2: Yoshi's Island story left off, the "parents" who the stork was trying to deliver Baby Mario and Baby Luigi to unfortunately didn't know they had babies coming and turned away the delivery... and as such the Stork has to continue on his journey to find the expecting parents of the two babies. As the stork soared with determination through the clouds he was unfortunately set upon, once again the poor stork (who really does need a new job) is set upon by the evil Magikoopa, Kamek. Baby Luigi is once more kidnapped, and Baby Mario falls down to Egg Island where once more the Yoshi Clan (potentially distant relatives of the Yoshi's who helped him on Yoshi's Island) take Baby Mario as one of their own and vow to reunite him with his brother. The Yoshi's are not just helping set out to defeat Bowser out of pure good will though, there has also been a worrying rumour circulating Egg Island that Bowser plans to take over the Island and turn it into his own personal holiday resort. Like its predecessor Super Mario World 2: Yoshi's Island (and the remakes such as Yoshi's Island DS) this game will continue as a side scrolling platformer with some new twists, inparticular the varying artwork styles in the games levels - some levels are watercolour themed, some are styled with oil paints, and theres even some levels with Crayon style backgrounds to name a few. One of the newest additional features is the ability to Swallow giant enemies whole and poop them out into a huge Yoshi egg, ever seen a Yoshi walking like John Wayne? Now you know why. When Yoshi throws these giant eggs they smash up everything in their path much like a Giant Mushroom would enable your character to do in other Mario titles such as Super Mario 3D World and New Super Mario Bros U to name a few - also the more destruction to your foes it causes, the more it fills up the on-screen gauge - you can earn up to three extra lives if you do good enough damage with it. We will see a range of characters returning including Blue, Light Blue, Pink, Purple and Orange Yoshi and of course plain old Green Yoshi, the Baby Bros as well as Kamek and his Stork victim. An additional feature is that the gyro sensor controls of the Nintendo 3DS are utilised along with the binocular ability; enabling players to move the system around which could reveal hidden areas and help to aim special attacks. 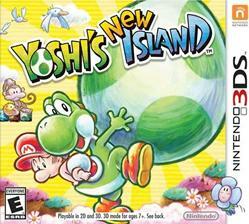 The official first look trailer of Yoshi's New Island from E3 2013. Cheats, walkthroughs, reviews etc to follow post-release.